The name of this band describes the experience of its gigs, including Victoria's first Ska Festival. 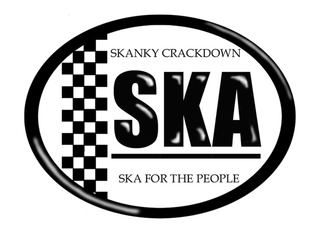 Skanky means that you want to skank to the tunes; Crackdown describes how a gig can be like a raid from which nobody escapes. Formed as a nine-piece ska band in Victoria in 1999, founder bassist Glenn ("Skanky G") had paid close attention during ska’s second wave – particularly to England’s Bad Manners and The Specials. He got drawn back in for the third wave through US ska-punk and old-school bands, particularly Suicide Machines and The Toasters. The new energy of the third wave helped to recruit a pool of 12 musicians to hold nine places on stage: Jeff on drums, Tania on keyboard and vocals, Dean on lead vocals, Paul on guitar, Clay on guitar, Dylan on guitar, Michelle on guitar, Ian on trumpet, Helen on trombone, Doug on saxophone, and Simon on saxophone. Everybody whose first initial fit went by a stage name that rhymed with Skanky G (e.g. Clay as "Skanky C" on guitar). In its first 6 months, Skanky Crackdown played 13 hot local gigs with such bands as King Apparatus, Easy Big Fella, The Kiltlifters, Skanic Boom, The Bloodwarmers, McGillicuddy’s, and Hi-Fi Ramblers. By mixing ska cover tunes that gain instant recognition together with bold originals that make the most of nine players, this band has lived up to its name. For the faint of heart, the same performance could be had under the name Stingray. As Skanky Crackdown or Stingray or under another name, Glenn hopes to reintroduce this band with a new line-up when the time is right. Good musicians enquire now. Everybody enjoy the audio samples here.